BBC NEWS | Americas | How will the Democrats wield power? How will the Democrats wield power? The Democrats have won majorities in both the US House of Representatives and the Senate. But how will they attempt to govern when they take office in January? In the aftermath of the election, all was sweetness and light. White House counsellor Dan Barlett said that President Bush would "extend a hand for cooperation to work on the issues facing our country." The new speaker of the House, Nancy Pelosi, said that the Democrats would govern with "integrity, civility, bipartisanship and fiscal responsibility". Tennessee Republican Senator Bob Corker said that "American politics going forward needs to be about healing." And on the most contentious issue in the election - Iraq - the Democrats have urged a co-operative approach. 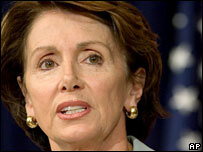 Nancy Pelosi asked Mr Bush "to work together to find a solution to the war in Iraq." And President Bush, in responding by dismissing Defence Secretary Donald Rumsfeld and replacing him with the well-respected former CIA director Robert Gates, has also signalled the desire for a more bi-partisan approach in foreign policy. But how long will the bi-partisan spirit last? The Democrats are keen to show that they can produce some concrete results after the voters showed that they were disillusioned with the 'do-nothing' Republican Congress. They campaigned on a "six-point plan" calling for open government, real security, energy independence, economic prosperity and investment in education, and health and retirement security for all. And they have already drawn up a short-list of achievable goals which they want to introduce in the first "100 hours" of office. In the longer term, Democrats have ambitions to tackle big issues like health care, domestic security, climate change, and the budget deficit. On health care, they want to increase the inadequately funded government prescription drug benefit for the over-65s, and tackle excess profits by the pharmaceutical industry. 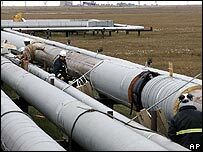 On energy, they want to shift resources to renewable energy, and question the role of the oil companies in setting policy on climate change. And they want more spending on domestic security, for example to make US ports and chemical plants less vulnerable to terrorist attacks. But the Democrats face formidable obstacles in achieving these goals. In the first place, they are split between the more liberal North-eastern and West Coast representatives, and the more conservative "Blue Dog" faction from the Midwest and South. The Blue Dog Democrats would place more emphasis on fiscal conservatism, reining in social spending and limiting the federal role in social issues. This would limit any plans to expand spending, for example, on the government's new prescription drug benefit - a key goal of many older Americans who switched to the Democrats. Secondly, for structural reasons the Democrats are likely to find it harder to keep tight party control in the House of Representatives, and party discipline has always been weak in the more independently minded Senate. The Republicans ruthlessly abolished seniority in the House and their leadership kept most of their own Congressmen on a tight partisan leash. But the Democrats under Ms Pelosi have said that they will restore seniority, which means that the longest serving members become the committee chairman. This will give the control of key House committees to mostly liberal Democrats from New York, California and Michigan. 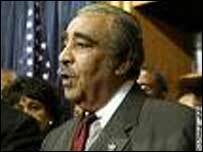 Under this system, Congressman Charles Rangel, who has represented Harlem in New York City for 36 years, will become chairman of the House Ways and Means Committee, which reports on all spending legislation - and one of the most powerful figures in Congress. Other key figures will include Henry Waxman, the 16-term Congressman from Hollywood, California, who will chair the Government Reform committee (charged with oversight of the executive branch); John Dingell of Michigan, the longest-serving member of the House, who will run the Energy and Commerce Committee, and Tom Lantos, the 78 year-old Holocaust survivor who will chair the International Relations Committee. But these Democrats will not only have to deal with their own side in the House. They will have to negotiate with the Senate, where they only have a razor-thin majority, and with the Bush administration, in order to pass any legislation and avoid a veto. In the Senate, the Democrats will depend on the votes of two independents: the socialist Bernie Sanders of Vermont, who had been the Congressman from that state, and Joe Lieberman, the Democratic Senator from Connecticut, and strong supporter of the Iraq war. Mr Lieberman was defeated in the Democratic primary by Ned Lamont but stood as an independent. And if things get difficult, the Republicans in the Senate can also use the tactic of filibustering to talk out a bill - something that requires the votes of 60 Senators to overturn. The Republicans, meanwhile, will have to find new leaders for both the House (where current speaker Dennis Hastert says he will stand down) and the Senate (where Bill Frist stood down in order to run for President). It will only be after that election that it will become clear whether they are prepared to take a more bipartisan approach. There are some bi-partisan issues where the Democrats and Republicans could work together. One area might be immigration, where the Democrats would be in broad agreement with the Bush administration's plans to grant a limited amnesty to some illegal immigrants - something fiercely opposed by many House Republicans. There could also be some agreement on tackling the budget deficit by cutting pork-barrel spending, and some agreement on further ethics reform to limit the role of lobbyists after the Abramoff scandal. But on the central domestic issue, the Democrats are now in position to reject Republican plans to extend and make permanent Mr Bush's tax cuts, such as the abolition of all death duties. But they may find it hard to come up with their own plans to cut the deficit without raising taxes, which would be politically unpopular. And they may also be reluctant to move too far on the social or values agenda, given that many of their newly elected Congressman and Senators come from socially Conservative areas and share their values. However, there would be strong Congressional opposition were President Bush to nominate another socially conservative justice to the US Supreme Court. There is now a chance that a bipartisan approach will now emerge on foreign policy, following Mr Bush's announcement that Robert Gates will replace Donald Rumsfeld as defence secretary - a key demand of the Democrats. Mr Gates is well-respected on both sides of the House, and is a member of the bi-partisan Iraq Study Group. This is headed by Republican former Secretary of State James Baker and former Democratic Congressman Lee Hamilton, which is expected to recommend a major shift in US policy on Iraq. In the past, most presidents have attempted to build a bipartisan approach to foreign policy, and when it became a polarised issue (for example in the l960s) that did not always help the Democrats politically. So many Democrats would be happy to see a change of course that led to a quicker pace of withdrawal, more consultation with allies, and a less confrontational approach to Iran and North Korea - especially as the Democrats themselves are split between hawks and doves. The Democrats also favour increased spending on the Army and on domestic security. With former war hero Senator John McCain the likely frontrunner for the Republican nomination for President in 2008, they are keen to show their own patriotism, both on domestic security and the armed forces. But if co-operation breaks down, there is no doubt that the Congressional Democrats can raise their concerns about Iraq, calling in Bush administration officials for questioning, and holding more inquiries into the past or present failings of the war.